Snow and ice accumulation can be catastrophic if not properly taken care of. Winter has at last descended on Maryland, and the snow and ice that come along with it probably aren’t far behind. While awnings are typically great for protecting you from the elements above, too much snow or ice accumulation can be catastrophic. 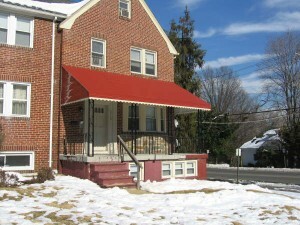 A soaking wet canvas awning can grow destructive mold and any type of flat version is susceptible to collapsing under the weight of excessive snow. Take advantage of these suggestions so your Maryland awning is ready to go in the spring. This might be painfully obvious, but the best way to avoid damage to a Maryland awning is to literally remove it from harm’s way. If you are willing and able to do so, it’s probably best to take yours down (if you have this option, which you may not with a commercial variety), give it a good cleaning, and store it someplace safe and dry until everything thaws out in the springtime. A Carroll Awning representative will even come to you and take it down for you if you want or need assistance. A well-installed awning should be able to stand up to a couple inches of snow, but it’s always a good idea to be aware of the forecast so you can take appropriate measures before the storm hits. This way you can be sure to know when the most snow is anticipated to come, and take proper actions to clear off some snow once it’s okay to do so. If you have a retractable awning, getting a cover for it is a good idea for year-round maintenance — not just in the winter. In fact, retractability is already a huge advantage in this instance, because if it’s rolled up and tucked away then it won’t gather any snow accumulation or be in any danger of collapsing. A cover for it will provide you with an additional sense of security, protecting it from moisture or other harmful weather effects.